We were very impressed by the quality of materials used in this large shed, as well as the attention to detail and commitment to security. You’d expect that with a shed of this price, but it was still reassuring to know that anything stored in this heavy duty garden building would be protected from both the elements and unwanted attention from criminals. The apex room is one of the features that aids the excellent weather proofing qualities, and they are aided by the interlocking tongue and groove panels used for the walls, roof, and flooring. Indeed, this flooring felt so secure that it would be more than suitable for the storage of heavy machinery or maybe even a motorcycle. 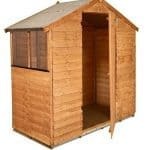 It’s why this building is so versatile, being suitable for use as a garden shed or a wooden workshop. It’s also good to know, of course, that it has the backing of a 15 year manufacturer’s guarantee. Natural light floods into the shed thanks to two substantial windows which feature strong safety glass. 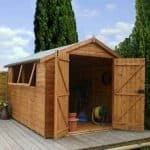 This allows you to see how beautiful the shed is both inside and out, although we would recommend painting it to give extra protection from the sun’s rays. This is a large shed or workshop built with security in mind. Its generous dimensions make it suitable for a variety of purposes, involving both work and leisure. The apex roof is sturdily constructed from tongue and groove boards. It not only gives even more storage space, and plenty of headroom for you to walk around in, it also adds to the already commendable weather protection. 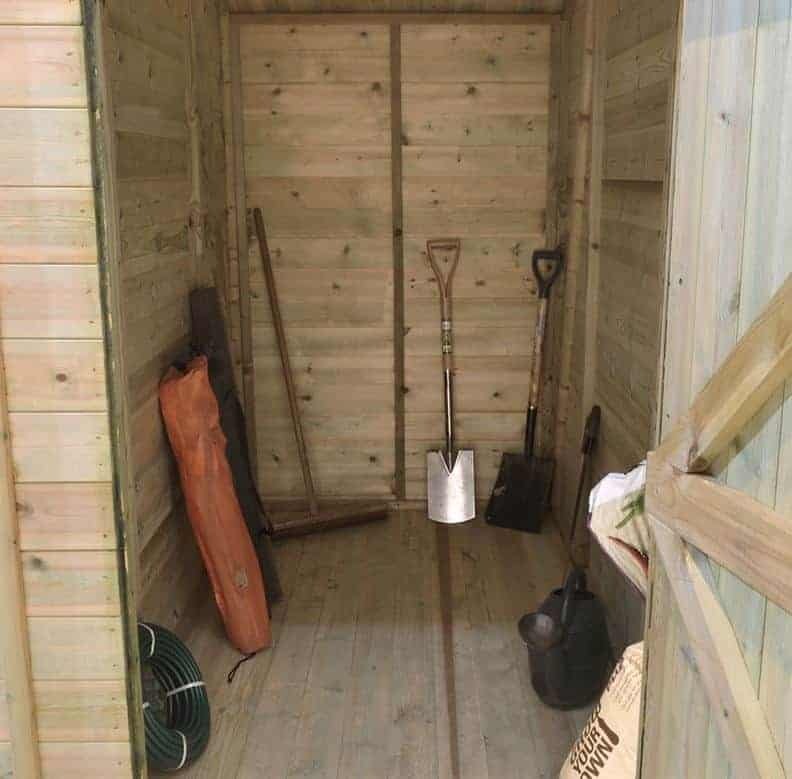 One feature we particularly liked was the extra storage area at the back of the shed, allowing you to keep the main body of the building clutter free. We were pleased to see that the roofing felt supplied was robust and easy to fit, as this is the shed’s first line of defence against bad weather. At its ridge the roof is 2.31m, and the eaves height is 1.73m. 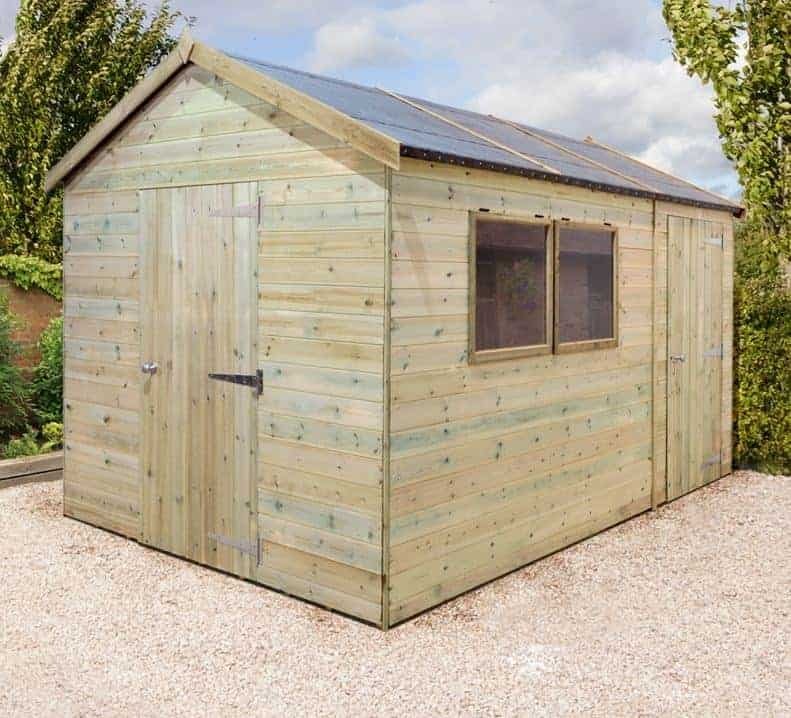 When we look at the dimensions of the shed itself, we find that it has a depth of 3.02m and a width of 2.44m, giving it an excellent storage capacity. One of the things that we really liked about this shed is that there have been no corners cut. For example, tongue and groove cladding is used throughout, on the roof and flooring as well as on the walls themselves. 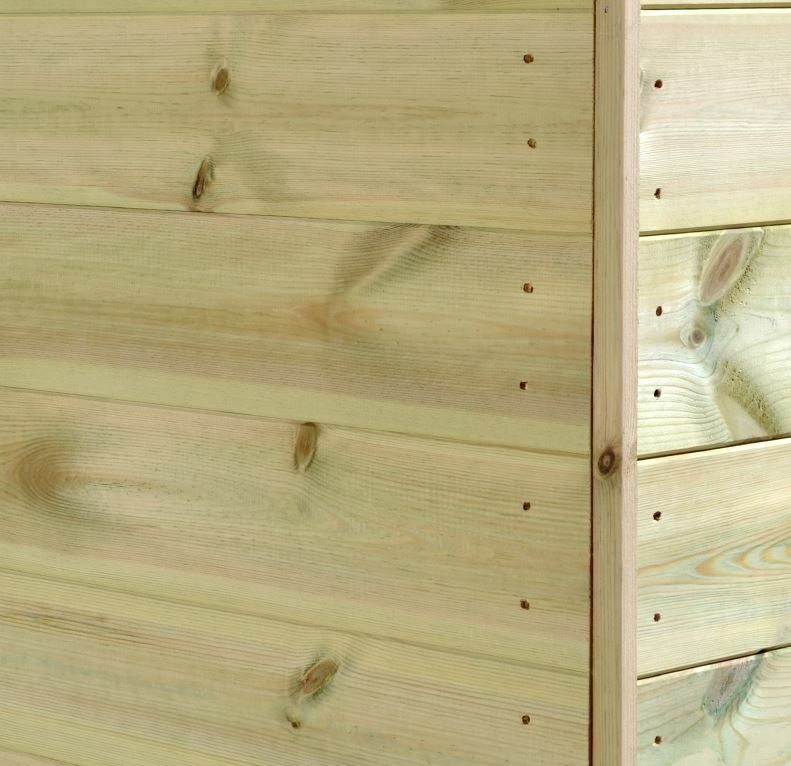 The cladding has been expertly machined, so it fits together easily yet tightly, although still allowing the movement that all timbers need in summer and winter. 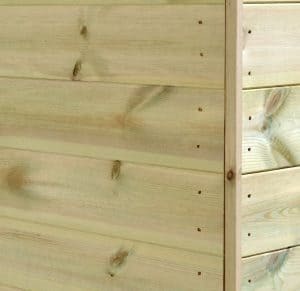 The interlocking timbers will prove very effective at stopping water getting in, and their 12mm thickness gives the structure a very solid feel without any of the flexing or creaking you can find in some wooden sheds. As this shed could well be used as a workshop, we really put the floor to the test. We wanted to see if there was any sign of the floor giving or feeling less than solid, but it was reassuringly strong throughout. 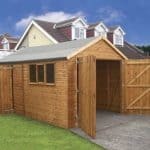 We always like to see a long manufacturer’s guarantee for sheds in this price range, so we were happy that this is covered against rot for fifteen years. This is possible because all the timbers have been pressure treated before delivery. This forces a high quality preservative deep into the timber giving it long lasting protection against wet and dry rot. It was also good to see that the integral floor joists had been treated in the same way, as they can be subject to moisture rising naturally from the ground. Because the preservative used is so long lasting, the manufacturer states that there is no need for further treatment by the shed owner. 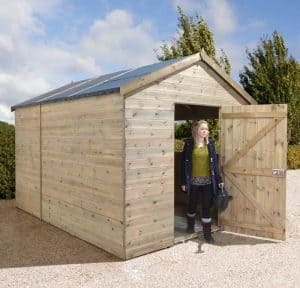 With an investment on this scale, however, we would always recommend inspecting the shed yearly and being prepared to add extra coats of a spirit or water based preservative. We were very impressed by the door on this shed, as it’s both well sized and strong. The door measures 0.89m wide and 1.80m high, so it’s easy to carry or wheel items in and out, once again making us think how suitable this would be for use as a workshop. It comes pre-fitted, and the hinges seem strong and secure. There are two windows adjacent to each other, and we were pleased that they were made out of safety glass as this means that worries about shattered or broken glass can be put aside. Another neat touch is that the positioning of the windows can be changed during the installation process, so you can adjust it to fit in with the design of your garden. This shed is both large and attractive, so this in itself can attract unwanted attention. 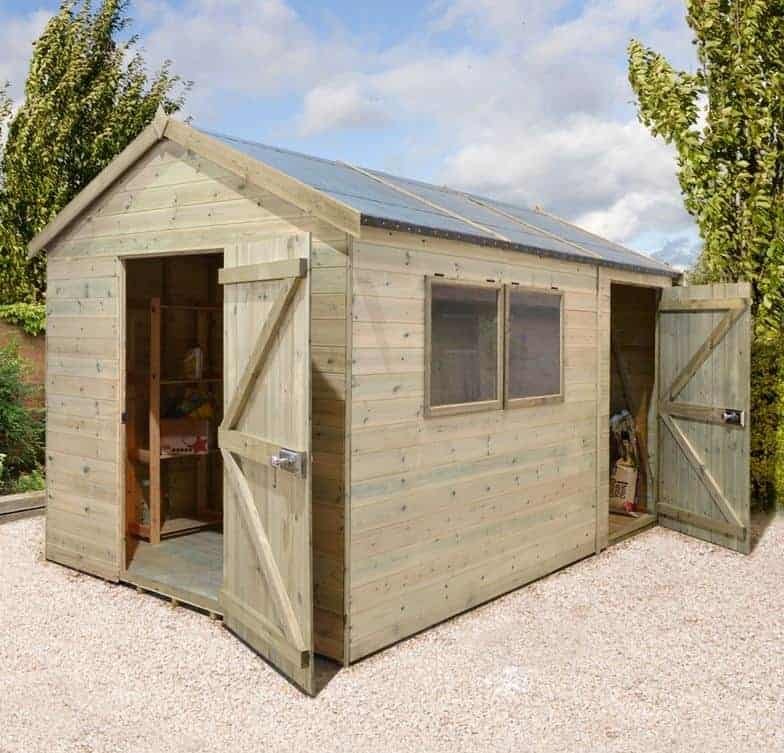 That’s why it was good to see that the manufacturers have included a solid lock and key system, meaning that the door on this shed can be as secure as the door on your home. Another inbuilt security measure is the additional storage area; as this comes without windows, there is no way for passers by to see what’s stored inside. We found the shed easy to install considering its size, although it was done over two days. If you’d like to save this time and effort you can take advantage of the optional ‘professional installation service’. 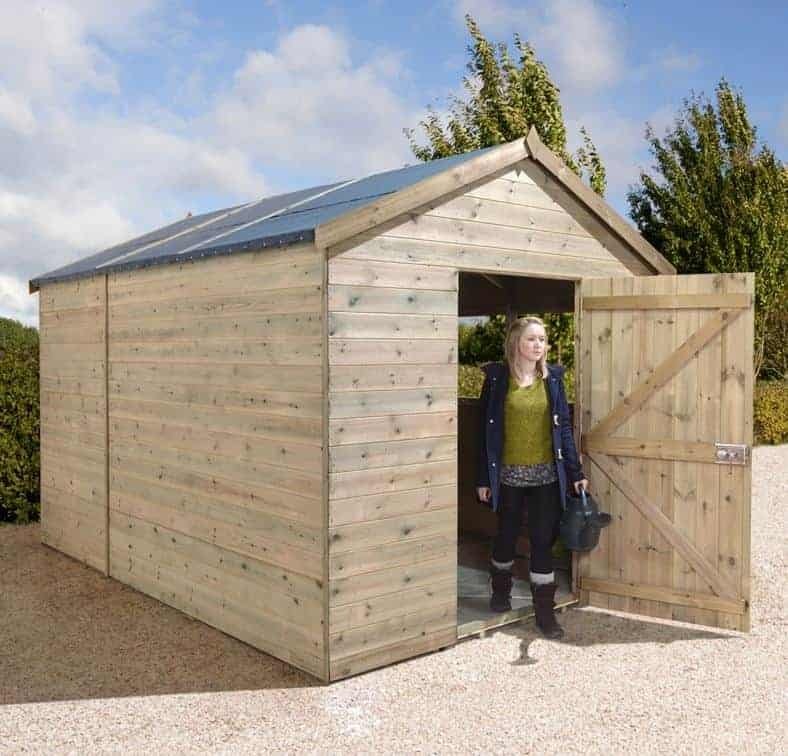 For just £149, you can be assured that this shed will be perfectly constructed without you having to raise a finger. Another customisation option is a slatted roof. The tongue and groove roof supplied is perfectly smooth, and stylishly modern, but a slatted roof can help your shed or workshop acquire a unique look that also has excellent rain proofing qualities. 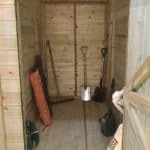 We expect to find quality in a wooden shed costing over a thousand pounds, and we certainly found it here. The tongue and groove cladding used across the shed is thick and durable. 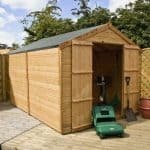 Fifteen years is a long time for a wooden shed to remain rot free without retreatment, but this is the promise the manufacturer gives. As always however, annual inspections are recommended. 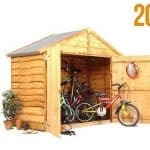 This is large enough to store all your garden equipment, to use as a secure bike shed, or to use as a workshop as long as flammable materials are not stored there. The additional storage area at the rear of the interior adds even more flexibility. It’s perfectly possible to put this shed together with a friend, as we showed when we installed it over a period of two days. You can make life easier, however, by taking advantage of the optional installation service. It has to be said that this is not inexpensive for a wooden workshop, but you have to consider the large capacity, and the 15 year guarantee that isn’t reliant upon the cost of annual treatments. 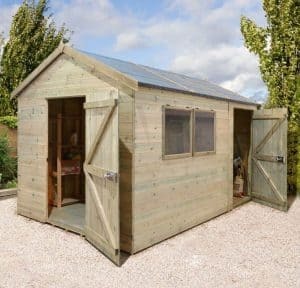 Final Thoughts: We highly recommend this garden building if you’re looking for an alternative to a metal workshop that’s made out of attractive wood. It looks great, and will look even better with two coats of paint or wood stain. Security is obviously important with a shed of this size, particularly if you want to use it as a storage facility. That’s why it was good to see that the manufacturer’s had provided a high quality integrated locking system. 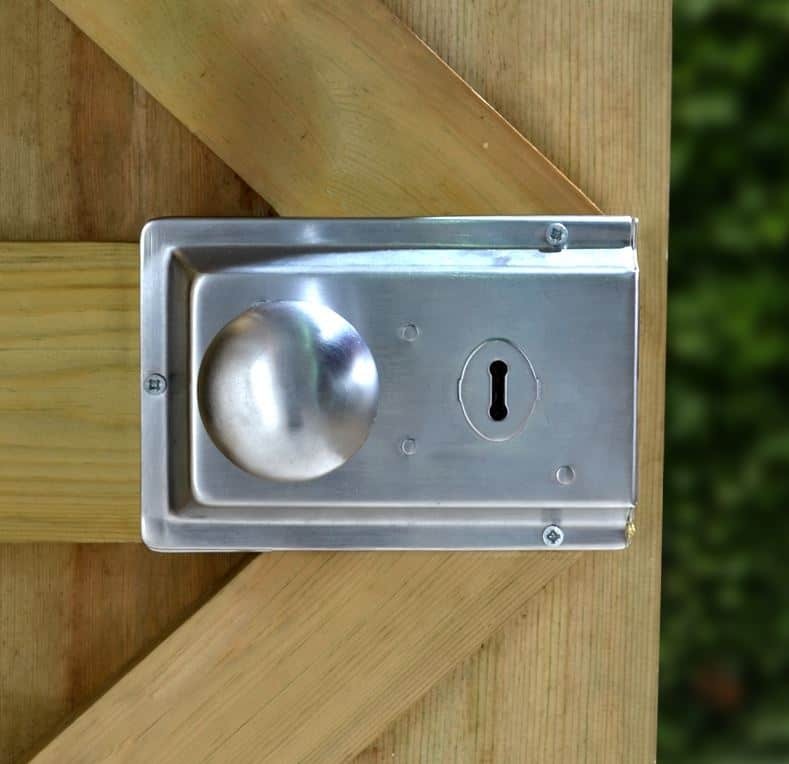 It means that you won’t have to worry about buying a padlock, although it may still be worth considering an alarm system. 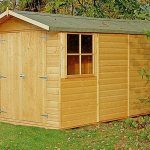 This is a high quality shed that also offers great weather resistance.